Birth Date: July 2, 2016 PMY 948D Red SSS N.K. 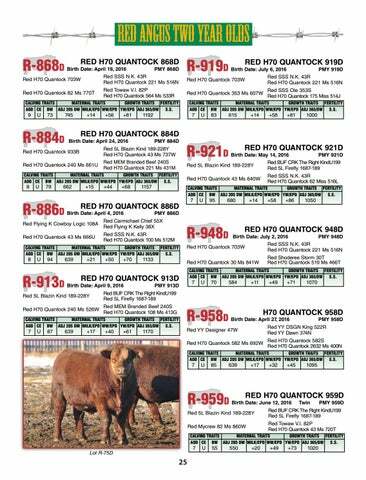 43R Red H70 Quantock 703W Red H70 Quantock 221 Ms 516N Red Shoderee Storm 30T Red H70 Quantock 30 Ms 841W	Red H70 Quantock 519 Ms 466T calving traits	maternal traits	growth traits	Fertility aod	ce	bw	adj 205 Dw	Milk/epd	ww/EPD	yw/epd	ADJ 365/Dw	S.S. Birth Date: April 27, 2016 PMY 958D Red YY DSGN King 522R Red YY Designer 47W Red YY Dawn 374N Red H70 Quantock 582S Red H70 Quantock 582 Ms 692W Red H70 Quantock 2632 Ms 400N calving traits	maternal traits	growth traits	Fertility aod	ce	bw	adj 205 Dw	Milk/epd	ww/EPD	yw/epd	ADJ 365/Dw	S.S. Birth Date: June 12, 2016 Twin PMY 959D Red BUF CRK The Right KindU199 Red 5L Blazin Kind 189-228Y Red 5L Firefly 1687-189 Red Towaw V.I. 82P Red Mycrew 82 Ms 860W Red H70 Quantock 43 Ms 720T calving traits	maternal traits	growth traits	Fertility aod	ce	bw	adj 205 Dw	Milk/epd	ww/EPD	yw/epd	ADJ 365/Dw	S.S.